Since social media arrived on the scene, the traveler’s journey has changed dramatically. Today, Americans look to social media and mobile tech when planning a trip, but they also use these tools during and after their vacation. Social media and mobile technology offer travelers real-time access to reviews, tips, photos, and location information. This crowd-sourced content has changed the trip-planning process, from inspiration to booking. Browsing through friends’ vacation photos on Facebook and Instagram is more than just entertainment—it often inspires a future trip. While travelers look to several channels when deciding where to go, social media is rapidly becoming a top source. Currently, a third of U.S. travelers take to social media when considering a trip. Different social media platforms influence users in distinct ways. For example, friends’ Facebook photos affect more than 50 percent of users’ travel plans. Whether a location is “Instagrammable” also matters—40 percent of UK Millennials consider how photo-worthy a location is when deciding where to go. On Pinterest, thousands of boards contain the words “travel inspiration.” Many of these boards aren’t destination specific; instead, they showcase the possibility of a trip. This often leads to further research and, ultimately, a booking. Plus, social media is where many travelers hear about new brands and destinations for the first time. They might not be searching for specific information, but they’re exposed to this content on their feed. This makes it essential for travel marketing experts to capitalize on social media’s popularity when appealing to future travelers. The surge in social media platforms’ popularity when it comes to making travel decisions is largely driven by mobile. Today, smartphones serve as the gateway to travel information for many consumers, with 42 percent of consumers using their phones to research trips. It’s not just research that’s conducted on mobile phones—consumers use their phones to make the final purchase as well. Forty percent of online bookings take place on mobile, and 57.5 million American adults will use their smartphones to book a trip this year. Overall, travel spend will reach $86.2 billion in 2018, meaning that there are ample opportunities for marketers to increase conversions. With a solid mobile marketing strategy, brands can showcase their hotel, restaurant, travel agency, or other travel-related services. Once a vacation is booked, many excited consumers turn to social platforms to post about their upcoming trips. They’ll also visit travel websites to find more information about their destinations. These consumers are eager to learn about new brands and services—52 percent of future travelers have liked a Facebook page related to their destination. Sharing updates with friends regarding travel plans is another common practice, with 59 percent of travelers stating that they’ve posted an update about an upcoming trip. In years past, taking a trip meant unplugging from technology. However, American travelers can’t seem to stop using their favorite social platforms while traveling. They’re often tuned into their devices, snapping photos and sharing updates. In fact, the majority of Americans—74 percent—will use social media tools during their getaways. Not surprisingly, smartphones are the most popular devices used while on the go. Eighty-five percent of consumers use their phones to book travel activities, including restaurant reservations and sightseeing tours. Plus, more than half of consumers—60 percent—rely on their phones for navigation while traveling. Social media users, especially Millennials, don’t want to simply embark on a trip—they also want to share their experiences online. Travel is an incredibly popular topic for social media posts; in fact, vacations are mentioned more often than celebrities like Katy Perry and Taylor Swift. So, which social activities are travelers participating in during travel? The most popular activity is posting photos across various networks. Overall, 60 percent of travelers use social media to showcase their vacation photos. This number rises for Millennials—a whopping 90 percent of young travelers share their vacation photos on social media during their trip. In addition to posting photos, younger travelers take to their smartphones for a host of other social activities. Two popular activities are checking in to locations and scrolling through friends’ posts. 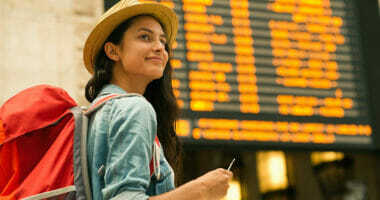 Thirty-nine percent of travelers ages 18–29 report that they would “check in” to an interesting location while traveling, which lets their network know about the visit. Keeping up with friends and family is also important to young travelers. Thirty-two percent said they’ve tracked their interactions on their social posts while on the go. Just because a trip has ended doesn’t mean it can’t find new life on social media and online. Today’s travelers continue to engage with brands digitally after returning home. Fifty-five percent of travelers like Facebook pages that are specific to their vacation. Travelers also will write reviews when their experiences are fresh in their minds: 46 percent will post hotel reviews, and 40 percent review their activities and attractions. Dining experiences are important as well, with 40 percent posting restaurant reviews. So, what’s the takeaway for travel brands hoping to spark interest through social media platforms? The data tells the story: social media is now a key part of the travel experience. Consumers take to social networks to draw inspiration, craft travel-related posts, and share their experiences upon their return. Brands that offer great content every step of the way will soon become part of consumers’ travel stories. To find out more, check out the full infographic, Vacationing the Social Media Way. Learn more about the importance of social media in today’s travel marketing. Contact MDG Advertising today at 561-338-7797 or visit mdgadvertising.com. MDG Advertising, a full-service advertising agency with offices in Boca Raton and New York, NY, is one of Florida’s top travel marketing companies and branding firms. MDG’s capabilities include branding, logo design, media buying and planning, radio and TV advertising, outdoor, newspaper, print advertising, direct mail marketing, digital marketing, website design and development, online video advertising, infographic design and development, email marketing, video marketing, mobile marketing, content marketing, social media marketing, paid search marketing, and SEO. To stay on top of the latest trends in travel marketing and advertising, contact MDG Advertising today at 561-338-7797 or visit mdgadvertising.com.